The ultimate guide to Pila ski holidays in 2019 & 2020. This small Aosta valley resort is made for skiers with cheap, ski-in ski-out hotels and wonderfully groomed pistes. Providing a feast for the eyes in the form of the Mont Blanc and Matterhorn massifs and a feast for the stomach in the way only Italians know how, this is a super place to learn or roam the untouched intermediate terrain. 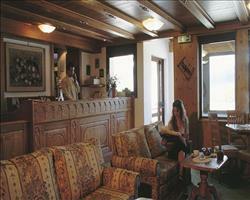 Pila is a small, quiet resort, built for skiing on the mountainside above Aosta town. As well as peering over the lights of Aosta, Alpine giants including Mont Blanc, the Matterhorn and Monte Rosa form the surrounding peaks and forests line the ski runs providing a stunning setting for a week on the snow. A summer destination for its calming and serene mountainside; Pila grew in popularity as a winter getaway over the two world wars and in 1949 opened itself as a purpose built ski resort. With a car-free village centre, ski-in ski-out hotels and well-groomed slopes, this is the perfect place for a convenient week on the snow. The hotel and restaurant sun terraces are usually bustling at the end of the day as people ski straight from the piste into venues like Bar Yeti for good old Italian food and vino. As the resort of choice for lot of school ski trips, this is a perfect place to ski for the first time, with gentle groomers and expert tuition providing an excellent introduction to the snow. Much of the piste is above 2000m and faces north, making it snow-sure for a lot of the season and a reliable area for late season skiing. You can visit a real mountain town via a 20 minute gondola ride down the mountain - Aosta is a beautiful medieval town originating back to 25BC, filled with culture and history for an added dimension of a fantastic ski experience. A local ski pass is available and you also have the chance to upgrade to the Aosta pass, which covers all the resorts in the valley. With Aosta’s attachment to the A5 Galleria Avise and the SS26 (the two main roads that run throughout the valley), La Thuile and Courmayeur are just a short drive away which makes Pila a good base to explore the rest of the area. View our detailed Pila snow forecast or snow report and see all live webcams, piste maps, road and travel maps and lift pass prices. For a picture of historic snow conditions see the snow depths month by month with our Pila snow history. Pila can be the start of a great ski experience with some excellent blues, including the easy to manage Baby Pila. Accessible by the Gorraz Grand Grimond and Pilla Gorraz chair lifts, Grimod is a long, winding blue with stunning views across of the Italian/Swiss Alps, including the Monte Rosa massif. La Nouva descends the right side of the mountain and is serviced by a chairlift of the same name. It’s also home to the halfpipe, making it a favourite for young riders. If what you’re looking for is red runs and lots of them, you’ll love it here. With a great mixture of steeps and cruisers, there’s a load of variety and thanks to this being such a popular resort for beginners, the red slopes are usually gloriously traffic free. Couis2 and Couis2-Variente are great runs with a nice mix of steeps and cruisers. The expert terrain is little in number but packs a punch, Tsa Creuisa is the highest black run and makes for a fantastic descent to the Leisse chairlift, including some small, particularly hair-raising treelined sections. From there you have the option of which direction on the mountain you take, with the top of the Leisse chairlift acting as a cross point for the mountain. The off-piste is also very good - hire a guide to show you the best powder. There are great ungroomed areas running parallel to the chairlifts and slopes, so it’s quite easy to find your way off-piste and back to a friendly run if you don’t have a guide. The Slopestyle Zone on Grand Grimond has two lines of varying difficulty for newbies and the super-skilled as well as a music system to add to the atmosphere. There’s also the aforementioned halfpipe just off the La Nouva lift, giving you the option for some freestyle action on both sides of the piste. Embracing Pila’s low-key and relaxed approach to apres-ski, most skiers are content to see off a day on the slopes with a relaxing hot chocolate or vino in Bar Mion or an ice cream in Bar Nouva. If you fancy catching the last of the rays and watching the sun go down over Mont Blanc, Monte Rosa and the Matterhorn, Bar Yeti is the place to be and also has great food options. 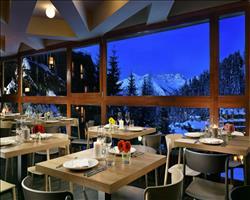 Most eateries have a focus on Italian and Alpine classics and what more could you ask for? At the end of the Pre Noir red run, La Montanara does fantastic pizzas. If you’re eating in the village and up for trying something slightly different, Bar Yeti has some very good donkey stew and is great for relaxing with a beer. Aosta is just a short gondola ride from Pila, meaning the shopping, restaurant and nightlife options are also much wider. For something at a faster pace, head down Aosta’s Old Distillery Pub, where you’ll find late night drinking, live bands, and maybe the occasional bit of barrel dancing. Gallagher’s Irish Pub is also a popular choice. A town rich in history, Aosta is fantastic for a day trip to enjoy the shopping as well as culture. You might even be there for one of the markets if you play your cards right. If you don’t mind venturing further out of town, the Pre Saint Didier spa is great for some ultimate relaxation. If you fancy something other than skiing, there are some great activities like bobsleighing, snow shoeing, dog sledding and snow tubing as well as a natural outdoor ice rink. When is the best time to ski Pila? Pila is sat at 1800m with access to north facing slopes up to 2700m, which means you’re likely to find snow sure conditions throughout the season. For groups, individuals or families who are flexible in when they can fly out, it’s well worth taking advantage of good conditions around January and February. As a popular choice for families and school trips, coming during non-holiday periods means you will generally find emptier slopes. If you’re tied to school holiday weeks, rest assured that with Italy having different weeks off and most Brits heading to France and Switzerland, things shouldn’t get too crowded here. Car-free, purpose built and small enough that many hotels are ski-in ski-out, this is a great place for a family ski holiday. Families who are new to skiing will find a welcoming resort with excellent tuition and gentle pistes. The Scuola Sci Pila has a kids club with indoor activities and lessons on the Baby Pila slope and lessons for older and more experienced children are also available. If you’re looking for somewhere to ski together after lessons, blue slopes like Grimod and La Nouva are long and winding to allow plenty of room to try out new skills. For anyone who doesn’t need lessons, a variety of red runs like Du Bois interweave the Chamole lift and with Pila being such a popular resort for beginners, much of the trickier terrain is usually blissfully crowd-free. If you have teens in tow, be sure to check out the Slopestyle Zone snowpark on the Grand Grimod which has varying lines of difficulty. The halfpipe on La Nouva is also great for all talents. If the clan need a break from the ski area, you can always take a day trip to ski nearby La Thuile or Courmayeur (both included in the ski pass) or explore the town of Aosta down in the valley. In the resort itself, the outdoor ice rink is a great place to start for some non-ski activities and you can also try dog sledding and snow tubing. However you spend the day, finish it at Bar Nouva for some fantastic ice cream or Bar Mion for some delectable hot chocolate. Brasserie du Grimond has a great kids menu (we love the pizza here) as well as a play area to keep little ones entertained while the grownups enjoy some well deserved vino. Groups will settle in very well here. The après is pretty low key, perfect if you like to sit back and enjoy good food and wine as you swap tales of your day on the snow. 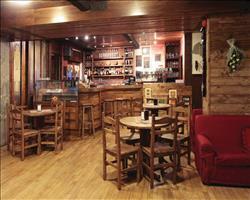 Restaurante Bar Yeti is fantastic – ask for a Bombardino if you want to try a true Italian après ski tipple. 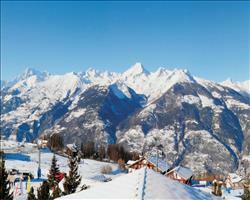 With good variety of blue and red slopes, Pila’s a great resort for groups of mixed abilities. The consecutive multiday skipass lets you ski further afield in Courmayeur and La Thuile which are just a short distance away and make the perfect day out. Off-piste mountaineering and heli-skiing are also available if you fancy a bit more of a challenge. Pila has super non-ski activities as well which lets you extend the invitation to those who prefer to stay off the slopes. There’s a lovely outdoor ice rink in the village centre and bobsleigh, snow tubing, dog sledding and snow shoeing are all possible without leaving the resort. 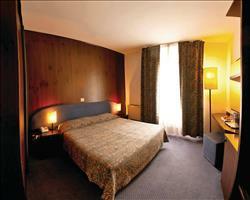 Most of the accommodation is based in hotels, where you’ll find pools, spas, games rooms, bars and sun terraces. If anyone does fancy heading out of the resort, Aosta town is a quick gondola ride down the mountain where you can soak up some historic town culture or enjoy some retail therapy. The town is also a great place to liven up the après ski if you exhaust the resort bars - you’ll soon become locals at Gallaghers Irish Pub and The Old Distillery.